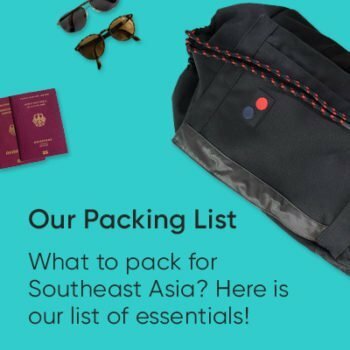 Where to stay in Hong Kong: Our favorite areas and hotels! 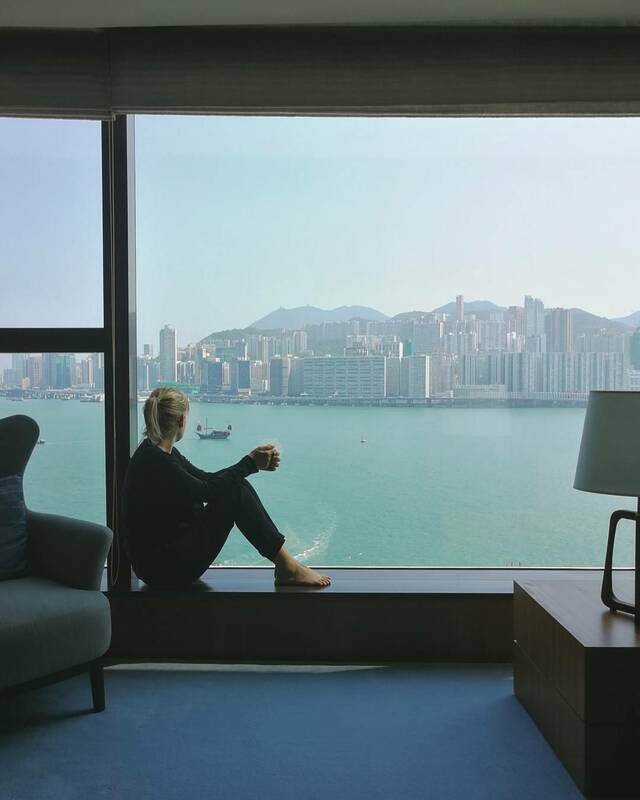 Especially if it’s your first time visiting, the question “Where’s the best place to stay in Hong Kong?” isn’t quite so easy to answer. After all, it’s a huge city! We’ve been to Hong Kong several times now and stayed in a different part of the city each time. 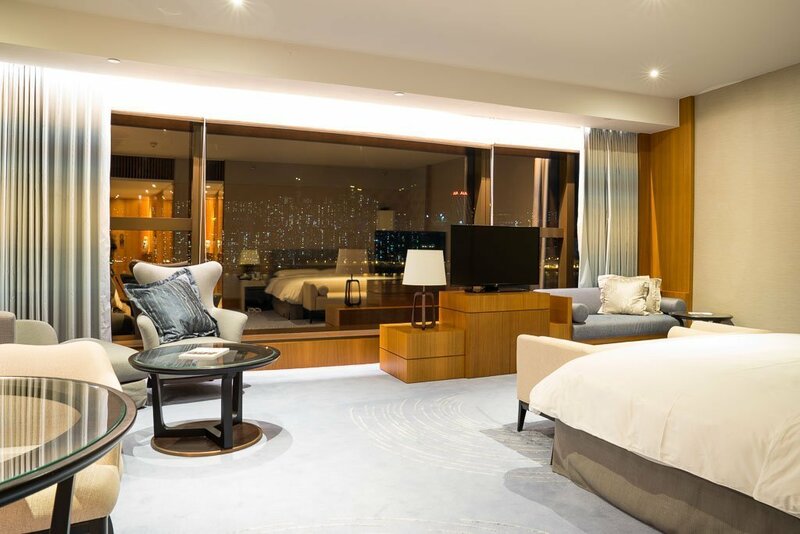 In this post, we’ll try to answer the question where you should go looking for a hotel in Hong Kong. We’ll show you which parts of Hong Kong are the best places to stay and give you specific hotel tips for each area. Of course, we’ll also tell you which hotels we’ve stayed at and give you our own personal recommendations. Let’s start with the bad news: Hong Kong is expensive. Very expensive. Housing prices here are amongst the most expensive in the world. 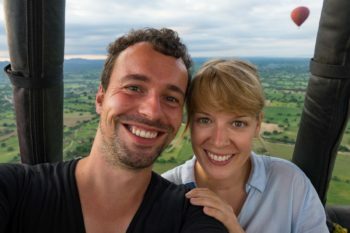 Locals pay about 3,000 euros per month for a small apartment of about 50 square meters. And of course, that also affects hotel prices. Rates may vary depending on the season and may be much higher on certain dates. The average room size is also significantly smaller than what you might be used to, e.g. in Europe. Rooms in very simple hotels are just about big enough for a full size bed that almost completely fills out the room with a bathroom so tiny you could easily take a shower while on the toilet. But even the smallest rooms offer basic amenities: They almost always come equipped with air-con and a flat-screen TV. 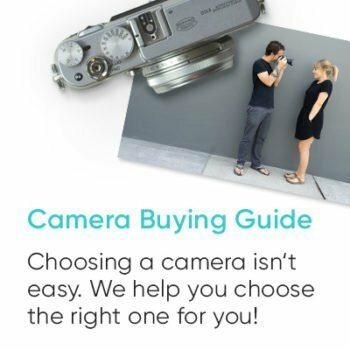 If you’re prepared to spend a bit more, things start to look much better of course. The rooms are larger and more luxurious, and with a bit of luck, you might even get a free breakfast. Hong Kong is huge, and there’s a wide range of hotels in almost every part of town. The public transport system is extremely well developed, so getting from A to B shouldn’t be a problem. 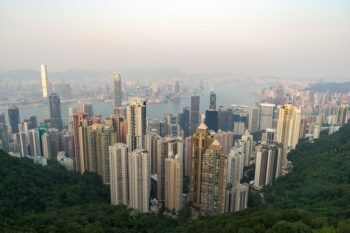 If you’re coming to Hong Kong as a tourist, you’ll probably spend most of your time in Kowloon and on Hong Kong Island. So staying in one of those two areas would make a lot of sense. Both Kowloon and Hong Kong Island are really vast, so we recommend picking the right district to stay within these two areas very carefully. In this section, we’ll tell you which of these four districts is the best place for you to stay. 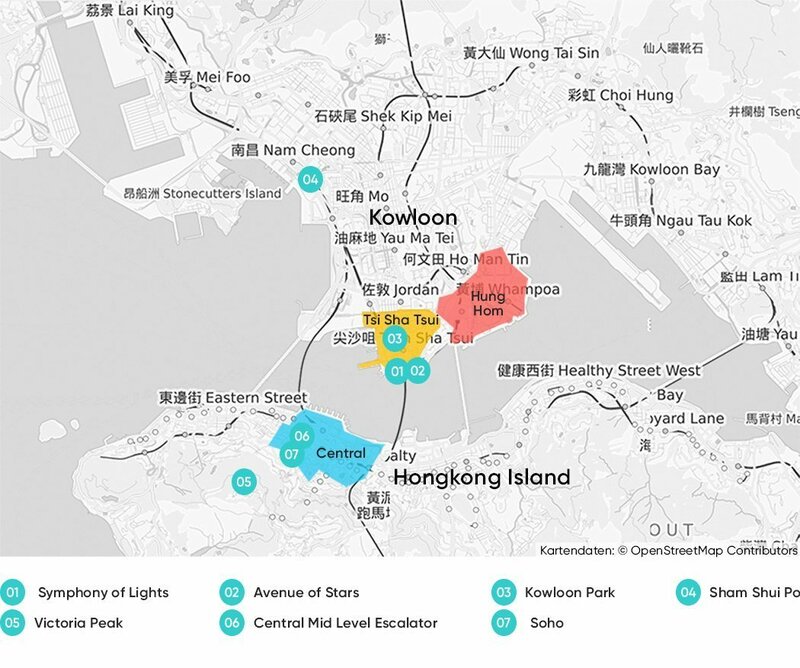 This map shows the three main areas of Hong Kong to give you a better overview. 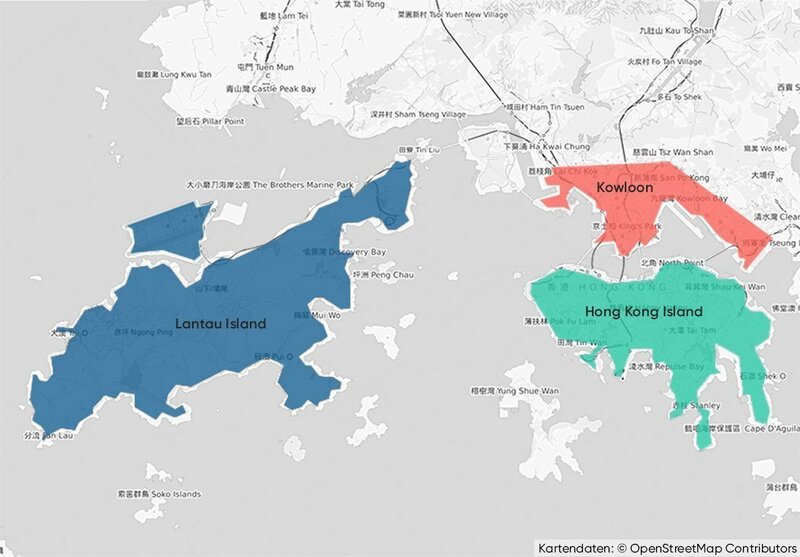 These are the three main areas of Hong Kong: Hong Kong Island, Kowloon, and Lantau Island. The Central district is located in the north of Hong Kong Island. There are plenty of sights here, as well as the trendy SoHo district with lots of bars, restaurants, and small shops. We liked Central the most of all the districts in Hong Kong and it’s definitely a great choice if you’re looking for a place to stay. The map shows Kowloon and Hong Kong Island. If you want to stay on Hong Kong Island, we recommend the Central district, colored light blue here. We’ve also marked a few selected sights to help you find your bearings. Many sights are within walking distance. Central has a great selection of bars and restaurants. The trendy SoHo district is in Central. Central feels less authentic than other districts in Hong Kong. Hotels in Central are a bit more expensive than in the rest of town. Relatively small selection of hotels. We spent one night at the former Ovolo Noho in Central which is now called Mojo Nomad. The building looks a bit like a matchstick and gave us a queasy feeling that it was about to topple over. But it didn’t. Lucky us. The hotel is in the perfect location. The rooms at the Mojo Nomad are tiny, but they’re also very modern and sleek. The breakfast is excellent, and more importantly: There’s a happy hour. Every night from 6 to 8 p.m., the hotel bar opens its drinks cabinets and you can treat yourself to free beer, wine, long drinks, and small snacks for a whole two hours. In a nutshell: The Mojo Nomad is a young hotel with a fresh concept. We would stay there again in a heartbeat. 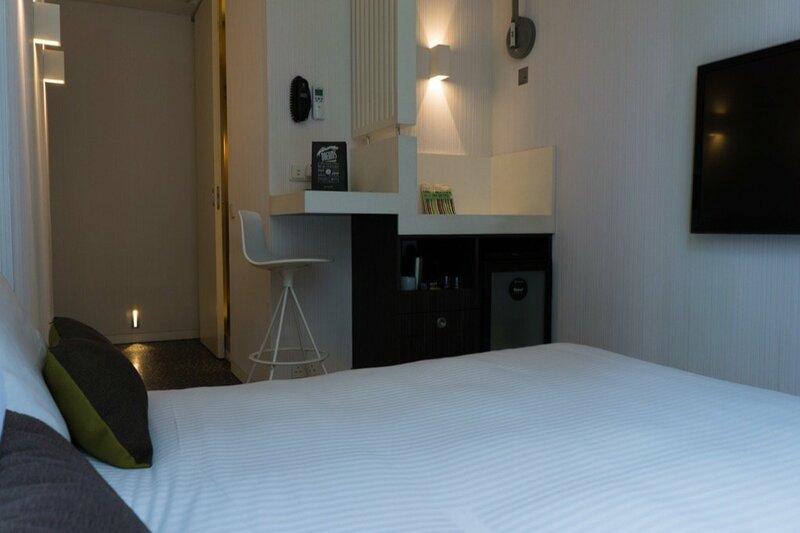 The rooms at the Ovolo Noho were sleek and modern. Mojo Nomad is even more stylish. Tsim Sha Tsui is located in the southern part of Kowloon. There are a lots of hotels, malls, markets, and a few sights here. It’s very conveniently connected to other parts of town via the MRT, so getting around is easy when you’re based in Tsim Sha Tsui. Nathan Road is packed with people scurrying from one glamorous shopping mall to the next. If you stray into the side roads, you’ll stumble upon interesting markets and local restaurants. The district is a great blend of old and new Hong Kong. The map shows Kowloon and Hong Kong Island. If you want to stay in Kowloon, there are two districts we can recommend: Tsam Sha Tsui (marked yellow) and Hung Hom (marked red). We’ve also marked a few selected sights to help you find your bearings. The markets of Kowloon are all nearby. Tsim Sha Tsui is the perfect mix of traditional and modern Hong Kong. Public transport connections from here are very good. There are lots of sights and attractions nearby. Largest selection of hotels in Hong Kong. The area is especially loud and hectic. The choice of restaurants and bars is better in Central. We spent three nights at the Holiday Inn Golden Mile and felt right at home there. The hotel has a perfect location directly on Nathan Street. Buses from the airport stop almost right outside the entrance, and the Tsim Sha Tsui MRT station is just opposite from the hotel. The rooms are relatively spacious and furnished according to the typical Holiday Inn standard. We didn’t try the 30-euro-per-person breakfast because there are better and cheaper options nearby. In a nutshell: A decent hotel with the standard the chain is known for. The Holiday Inn Golden Mile offers comfy and spacious rooms in a prime location. Hung Hom is also located in Kowloon, to the east of Tsim Sha Tsui. The area is much less touristy than other districts in Hong Kong, which is one of its main appeals. Nevertheless, there are plenty of restaurants and the MRT connection from there is also really good. We especially liked the Hung Hom Promenade, where you can take a walk along the waterfront with a great view of the skyline of Hong Kong Island. There are only very few hotels in Hung Hom. Even so, we wanted to add this area to our list because our absolute favorite hotel is located here, and we just had to share it with you. The area is much less touristy than the other districts. You get a higher standard and more space for your money. The promenade is a wonderful place for a stroll. Bars and restaurants don’t quite as readily cater to western tastes. There are hardly any sights in the immediate vicinity. Wir stayed at the Kerry Hotel in Hung Hom. Our verdict: Wow! No exaggeration, the Kerry Hotel is one the best hotels we’ve ever been to. The rooms are very spacious by Hong Kong standards. The hotel only opened in mid-2017, so the rooms are brand-new and modern. Breakfast is exceptionally good and about two thirds of the rooms have a direct view of Hong Kong Bay. Of course, this hotel doesn’t come cheap, but it’s definitely worth it. And there are good offers on certain dates. In a nutshell: An outstanding hotel with a view to die for. Lantau Island is located in the southwest of Hong Kong and is the best choice if you’re looking for a hotel near the airport or near Disneyland. The quaint fishing village Tai O is also located on Lantau Island. It offers traditional accommodations far removed from the hectic hustle and bustle of the big city. If you’re staying in Hong Kong for longer, we’d recommend one of the other districts because it takes about 30 to 45 minutes to get from Lantau to the main sights on Hong Kong Island or in Kowloon. The map shows Lantau Island. 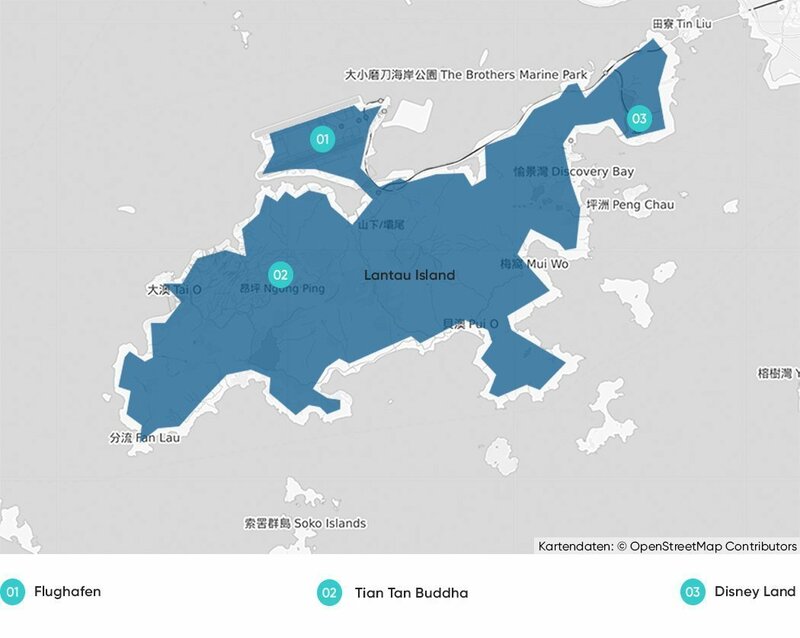 In this section, we’ll show you the best areas to stay on Lantau Island. It’s really close to Disneyland. Most of Hong Kong’s sights are quite a way away. The range of restaurants and bars is relatively limited. Do you have a favorite hotel in Hong Kong? 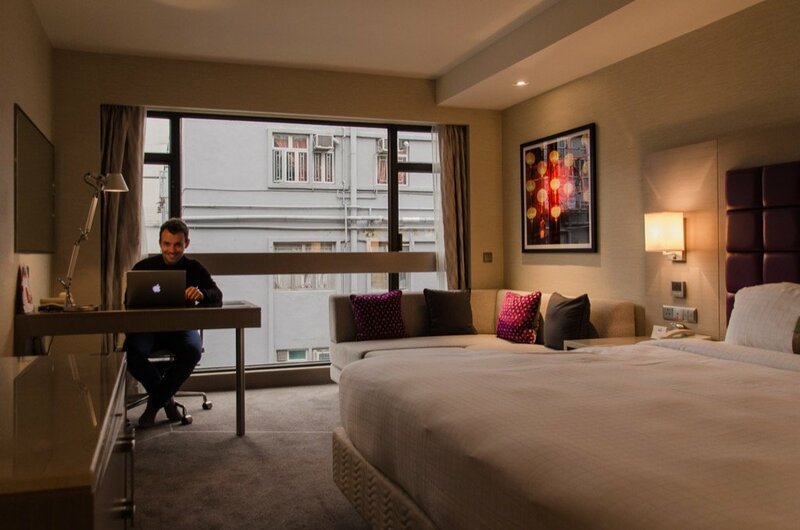 Have you ever been to Hong Kong and found a great place to stay? Or did you shack up in one of the 20-bed dorms? Then leave a comment! – We’re excited to hear about your experiences. We’d like to thank the Kerry Hotel for the invitation and the Holiday Inn for a discounted press rate. 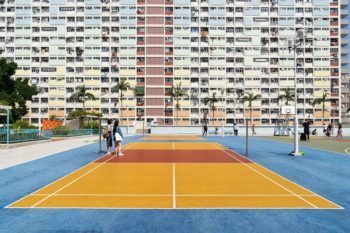 A district-by-district travel guide to Hong Kong. Discover Hong Kong off the beaten track!